It is starting to look a lot like winter over here. We had some snow flurries this morning and temperatures have dropped to the 30s. I think that from my past posts, it's pretty clear that I am in love with fall in New England and I am not ready to let it go yet! 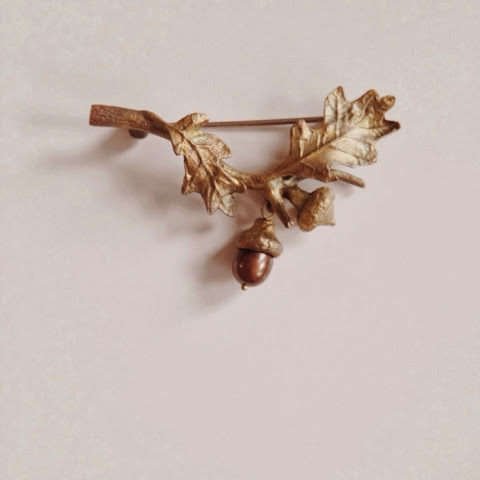 So, while on a quick antiquing trip on Sunday I found just the perfect little brooch that will help me hold on to fall! To be honest, I wasn't the one who found it. It was my new friend and fellow Etsy seller Erika who spotted it among a ton of other brooches. She has a great eye for jewelry, and she told me that's how she started on Etsy, 5 years ago. We met for coffee on Sunday morning and we hit it off instantly! She is such a lovely person! We talked about our Etsy shops, how do we set up for our photos, our pets, our lack of space at home, our love for Boston... And then we went to check a tag sale and an antique shop, where we found some great things for our shops and for ourselves. Be sure to go check out her shop, she has amazing stuff! That pin is so adorable! I love the dangling acorn!